(Newser) – President Trump's new communications chief likened the protracted Republican battle to end ObamaCare with Abraham Lincoln's fight to end slavery, the Guardian reports. Anthony Scaramucci tells the BBC that Lincoln needed patience to push through his agenda. "It took Lincoln three or four times to get what he wanted from the Senate and the House of Representatives, which was the full abolition of slavery—that was a much tougher thing to get done than what we’re working on right now." After six months in office, he says Trump is not facing undue resistance from his own party in his bid to repeal the health care law. 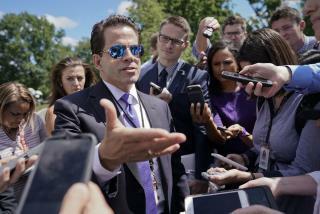 "It took 22 months for President Obama to get what he wanted from the legislature," Scaramucci adds. Look out. naacp, blm will be out in force. He said the S word. Anyone interested in a pool of how long this bone head will last? Lincoln was a Congressman for a long time, so he knew how to work Congress.